DMG Ice is a content Hub. Our simple design makes navigation easier for all devices. You're welcome. What you see here is the rough Beta Test for the main Hub site. Radio DMG is our Podcast and Random BLOG section! You'll also find blogs on there. Area DMG is where all of our sweet video content is located. 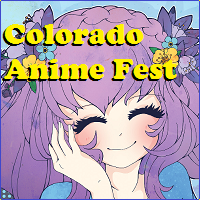 If you're here from Colorado Anime Fest 2019, tap this picture! Please disable your AD BLOCKER or similar products on this site. Having an ad or two above this sentence is how we buy coffee. Other Events Focus Coverage Coming Soon! Please read the site disclaimer for more details. Optimized for TOUCH devices. We usually cycle in new Featured Content Buttons on weekends. Usually. Subscribble to us on social media for more information. The DMG ICE hub updates randomly, you're welcome. (c) Philip Andrew Wesley 1997 - 2020.